in your life. Click here to enter! Welcome to Three Things Thursday- where I can share with you some things that have inspired me this week. As I'm sure you can guess, Christmas is on most every crafter's mind these days. There are so many amazing home decor projects out there that I almost feel overwhelmed! I've got to choose a few to do, and then just smile and be happy at the rest. 1. What a great way to use those mini ornaments from the dollar store (Target's dollar spot?). The House of Bledsoe put together this Mini-ornament Garland that I love! 3. 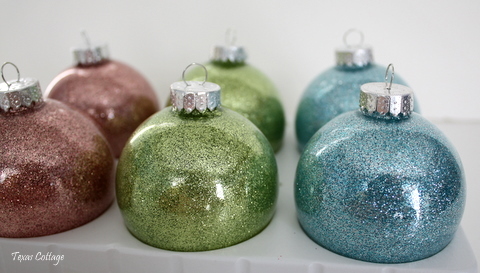 Texas Cottage shows us how to make these no-mess Glitter Christmas Ornaments. They're gorgeous, and it sounds so easy to do! Thank you for featuring my Mini Ornament Garland, yes I found tubes of the mini ornaments in the Target Dollar Bin, there were 16 in each tube! I am so excited thanks so much for the feature, I really appreciate it! Tweeting & fb'ing this! Valerie, thanks for featuring the glitter ornaments. They really are so simple to make and virtually mess-free (unless you're a klutz like me)!